This is a simple, and delicious dish to make. And much healthier than eating french fries, though just as tasty. 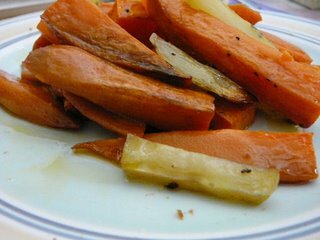 Peel potatoes (and other root vegetables if you like), and chop into wedges. Brush with olive oil, use dashes of salt and pepper. Bake ~ 375 - 400 degrees F for 45 minutes to an hour. Sweet potatoes will taste best slightly cooled.